I know it’s only been a couple days but I miss you already. There’s so much about you that I love – the way you approach situations in a relaxed and positive way, the way you absorb whatever strange element come at you and you just fold it into your nature. I admire you and your ease in the world, but it also stirs my anxieties about life – why can’t I be so cool, relaxed, so positive? I’m always wrapped up in my crazy modern brain and life. But then I wonder, are you too? Maybe you’re just as conflicted and human, but everyday you make the choice to express yourself in an uplifting and unselfconscious way. Can you show me how to do that? 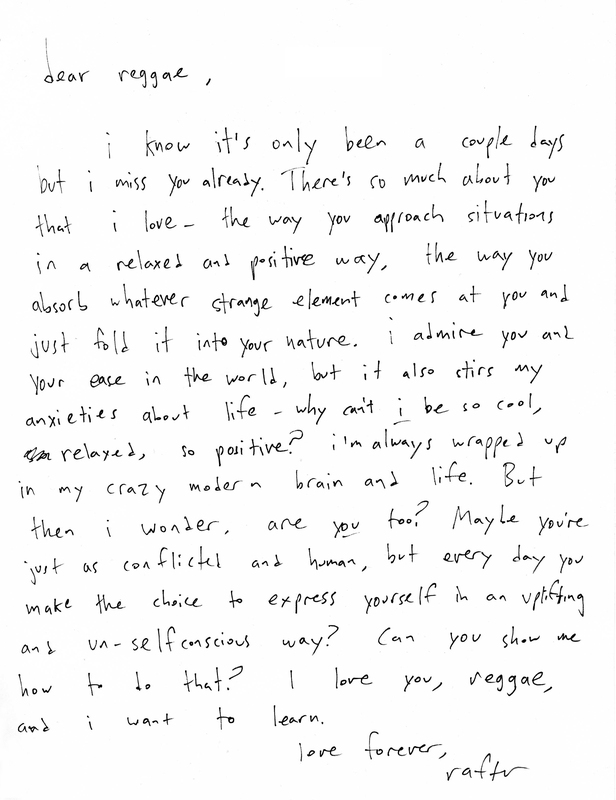 I love you, Reggae, and I want to learn. Rafter, It's Reggae! Cover Art (Digital, CD) Rafter, It's Reggae! Cover Art (Digital, CD) Rafter, It's Reggae - LP Front Rafter, It's Reggae - LP Back Includes download card. The music released under Rafter’s name is a kaleidoscopic fountain of color and beats and joy. It’s smart, beautifully-produced pop and R&B jams as seen through the lens of a man with a deep well of experimental and noise chops.